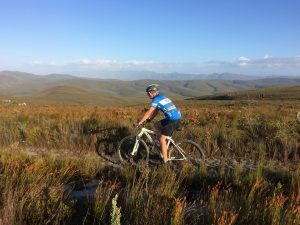 Having opened the 30km Klipspringer mtb trail in the Walker Bay Fynbos Conservancy on the 10 th Decmber 2016 we have had some great feed back about the route from riders over the Christmas holidays. The tough climb up through Farm 215 is rewarded by magnificent views and an incredible diverity of fynbos. 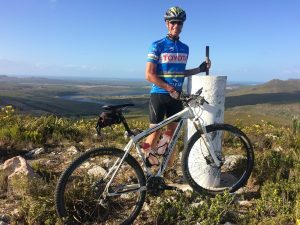 This King of the Mountain segment is already being hotly contested by Strava users as is the second tough climb up to the beacon on Witvoetskloof. With a couple of super fast down hills thrown in for an extra adrenalin rush the route is tough but lots of fun. 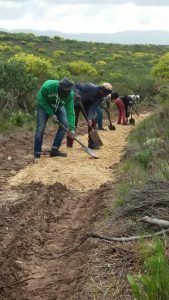 Thanks to our conservancy manager Thilivhali Murivhami and his dedicated team for getting this trail ready in time for the holiday season. They are now hard at work developing a shorter route as well as making some improvements to the 30km route. Thanks also to all the riders who made use of the honesty boxes at the starts at Flower Valley and Lomond – your permit fees are going to be reinvested into this route to make it even better. Excellent work! Well done for creating this route where cyclists can be safe and off the treacherous Stanford/Gansbaai road???? We need a cycling route parallel to the above mentioned road?? Fantastic! Looking forward to seeing the development of these trails. Mountain bikers are going to be delighted. 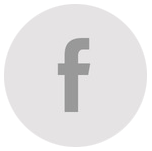 Please create listings for your trails on our website. You can also add landmarks and routes if you like. Really good to see trails opening up in this beautiful area. Please keep it up. Well worth the permit fees; I’m sure many feel the same.